Now, just a month after that record-breaking sale, Robert Edward Auctions is selling another alleged Jackson artifact with game use—one of his famous “Black Betsy” bats. This bat, however, doesn’t have Jackson’s name burned into the wood or written in grease pencil. To the naked eye, its just a prototype of a Dead-Ball era bat with a “black betsy” finish administered to its surface. 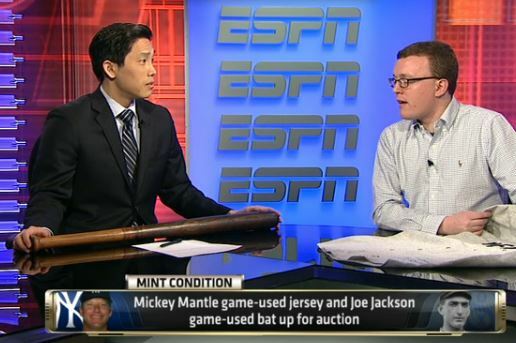 REA's Brian Dwyer brought the alleged Joe Jackson "Black Betsy" bat on to the set of ESPN's "Mint Condition" and made unfounded claims the bat was game used by Jackson. Bingo! Dwyer told Chow the bat was “game used” just like the million dollar Heritage bat. The REA offering also comes with a letter of authenticity from PSA/DNA bat experts John Taube and Vince Malta who claim the war club was “authentic and game used by Jackson.” The PSA opinion catapults this bat into an exclusive category far removed from examples which can only be “attributed to Shoeless Joe Jackson.” These “attributed” examples that have been examined by PSA/DNA have historically fetched prices in the $10,000-20,000 range—a far cry from Heritage’s million-dollar Jackson gamer. But although REA and PSA/DNA have christened the bat as “game used,” it significantly differs from the Heritage bat which was actually cracked via game-use by Jackson and sent back to the Hillerich & Bradsby factory in Louisville, Kentucky. Unlike the alleged Black Betsy featured in the REA catalog, the Heritage bat has an H&B provenance and was handled by an H&B employee who added the “Joe Jackson” name on the barrel and the vault marking “J13″ on the knob and barrel head. The rest is memorabilia history. The 1911 Jackson bat sold by Heritage came with a PSA/DNA letter detailing two "J13" vault markings and the "Joe Jackson" name burned into the barrel. In contrast, the alleged Jackson bat being offered by REA is blank without the "J13" marks or Jackson name. But how could the bat be “VIRTUALLY IDENTICAL” if it doesn’t even feature “Shoeless” Joe’s name or the H&B factory vault markings? It ain’t so. And it’s not even close. Upon reviewing the images of the bat and reading the fine print in the REA catalog, its clear that this “Black Betsy” offering has no verifiable provenance and no identifying markings that show the bat was made for or used by Jackson. There is no script or block-letter name burned into the barrel or even a grease pencil factory notation with Jackson’s name written upon its return to the H&B factory. Period photos show that "Shoeless" Joe Jackson used the two-tone "Black-Betsy" style bat during his entire MLB career from 1908 to 1920. The bat appearing below the photos is an H&B Jackson "Black Betsy" signature model that originated from a 1980's "find" at the Louisville Slugger factory. Despite the confidence the auction house has in PSA/DNA’s definitive assertions, Hauls of Shame couldn’t get past this particular claim of “Black Betsy” game use without further examining the veracity of REA’s claims. 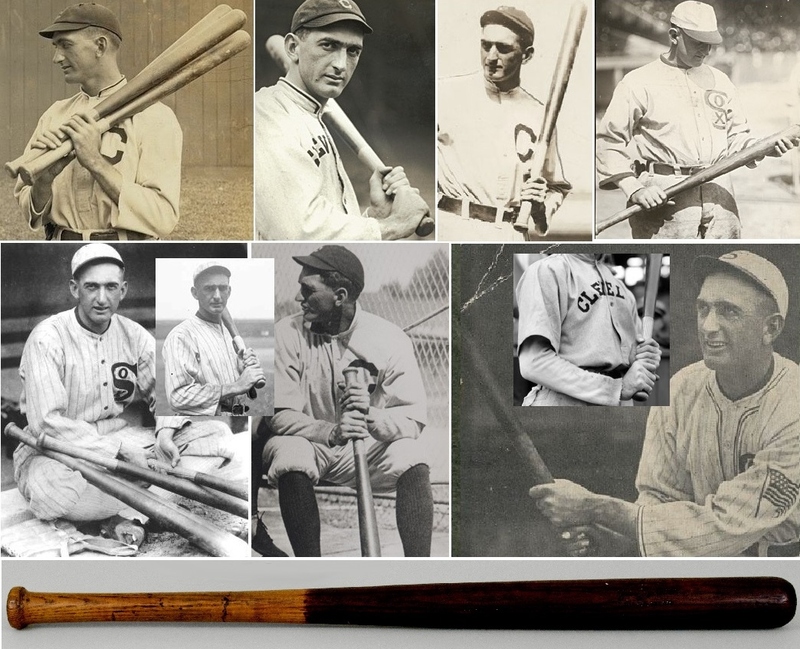 We’re not sure what resources the companies utilized in preparing their reports, but in one day of reviewing auction websites, BlackBetsy.com, the Library of Congress photo archive and even the MEARS website, we found substantial photographic evidence illustrating that many players other than Joe Jackson used what appears to be the exact same “Black Betsy” style bat. 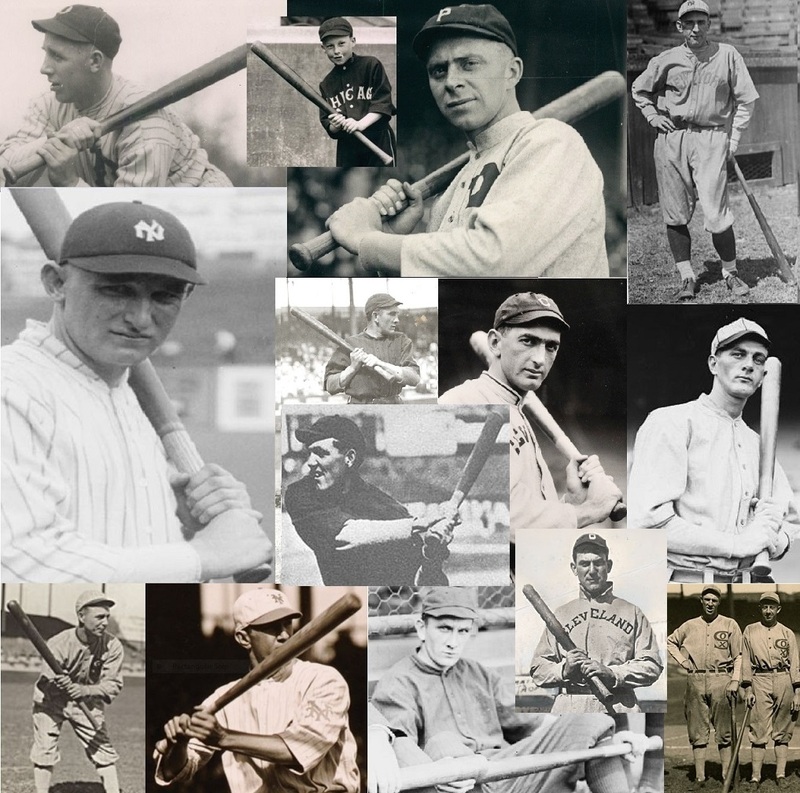 Other players used what appears to be a "Black Betsy" style bat including(Clockwise): Bob Fothergill; a White Sox batboy; Bob Killifer; Glenn Killinger(NY Giants); Carl Mays; Buck Weaver; Rabbit Maranville; Joe Jackson; Nap Lajoie & Walton Cruise (St Louis); Ray Schalk; Dave Robertson; Maranville and Swede Risberg. In addition to Joe Jackson, his White Sox teammates Hap Felsch and Swede Risberg also used Black Betsy style bats. PSA notes that they have examined another similar finish on a Chick Gandil bat they previously authenticated. How could the experts at PSA/DNA make such a definitive claim considering all of the images existing of players other than Jackson who were swinging what appears to be the same model bat? In regard to H&B player endorsements, Louisville Slugger Museum curator Nathan Stalvey told us that the Museum and H&B factory have only one document related to Joe Jackson and its his 1915 endorsement contract for his own branded signature on bats. 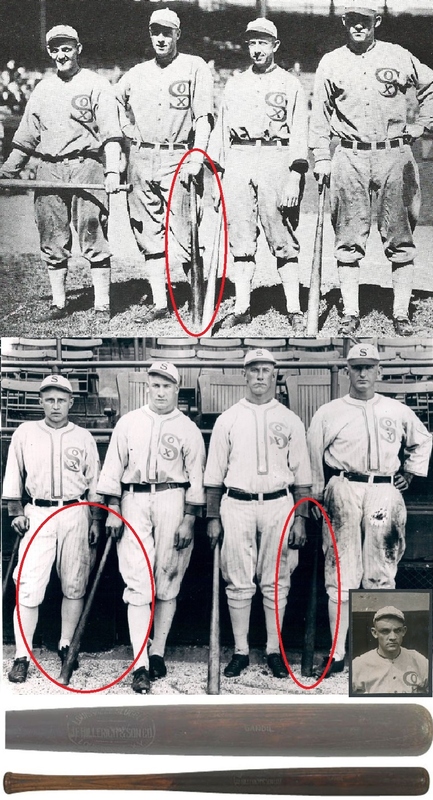 And speaking of Jackson’s White Sox teammate, Chick Gandil, what about additional photos we found showing that his other teammates Hap Felsch and Swede Risberg appear to be holding (along with Jackson) the same two-tone Black Betsy style bats as well? Back in 2011, Robert Edward Auctions offered a different Black Betsy style bat which sold for a modest $18,800 because it was advertised only as a “1916-1917 “Black Betsy Bat Attributed to Joe Jackson.” The same bat was also sold by Mastro Auctions in 2008 for over $25,000. The bat had something in common with the current REA Jackson bat offering in that it also had no identifiable markings that linked the lumber to ownership or game use by Jackson. The REA Black Betsy "attributed" to Shoeless Joe Jackson sold for $18,000 in 2011 while a "Game Used" version currently being offered by REA has a reserve price of $50,000. Both bats are nearly identical and have no markings linking then to Jackson. In their letter of opinion, MEARS never says the bat was game used by Jackson and when we asked Troy Kinunen what he thought about the “game-used” claim made by PSA he replied, “The title of the item in my letter (of opinion) speaks for itself.” Kinunen believes the bat is a 100% authentic “Black Betsy” model, but by no means a 100% authentic bat actually swung by Jackson. Again, Kinunen’s statements do not address the recent photographic evidence we have compiled showing that many more MLB players utilized the same dark finish on their own Black Betsy style bats, including Jackson’s own teammates. Unlike PSA/DNA, however, Kinunen does not claim that he can put the bat in Jackson’s hand at any time between 1919-1922. Troy Kinnunen of MEARS (left) says the REA bat is just "attributed to" Joe Jackson while John Taube (center) and Vince Malta (right) of PSA/DNA say it was "game-used by Jackson. Vince Malta of PSA/DNA has authored a reference guide for Louisville Slugger bats. MEARS clrearly states that the current REA bat is a game used pro-model “Black Betsy” that could have been used by any Major Leaguer, but Rob Lifson chose to highlight Kinunnen’s statement that it is “a 100% verifiable game used Black Betsy bat.” In what can only be described as an exercise in deceptive creating writing, Lifson attempts to couple Kinnunen’s statement with the PSA opinion to elevate the bat to game-used status without ever mentioning that the actual MEARS letter fails to say the bat was ever game used by Jackson. When Lifson sold the 2011 bat that was merely “attributed to Joe Jackson” bidders and collectors had the final word and the bat sold for only $18,800. Meanwhile, the current alleged “game used” Black Betsy bat in the REA auction has a hefty reserve and opening bid price of $50,000. Why? It’s that one line in the PSA/DNA report where Taube and Malta say REA’s bat “was game used by Jackson during the referenced labeling.” With one sentence, it appears that the PSA experts have transformed a rather generic relic from the Dead-Ball era into one of the hobby’s holy grails. 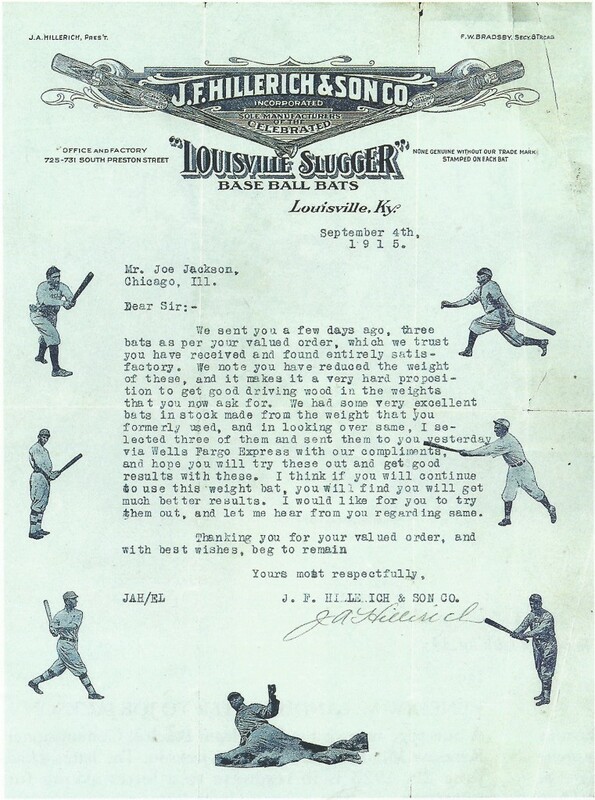 This 1915 letter sent to Joe Jackson by H&B shows that Jackson requested bats at a reduced weight. We don’t know what Jackson chose to do after he received that order of reduced weight bats. We do not know what his ordering preferences were from 1911 to 1915, nor do we know the changes he may have requested later in his MLB career from 1916 through 1920. The existence of this letter underscores the fact that the bat authenticators at PSA/DNA can’t be sure of anything when it comes to pre-1920 H&B player bats. While Taube and Malta have made considerable research contributions that help collectors date H&B bats and determine whether bats are professional or store models, most of their conclusions regarding game-used bats are nothing more than guess work and hyperbole. Joe Jackson could have used hundreds of H&B bats during his baseball career and its virtually impossible for the bat experts to say with certainty that a bat they’ve examined was actually held in his hands in the course of a baseball game. Based upon their research, PSA experts Vince Malta and John Taube have established the manufacturing date of the current REA Jackson bat as “1919-1922″ and the “attributed” Jackson bat sold at REA in 2011 as dating from “1916-1917.” Since both of those bats do not have Jackson’s name burned in the barrel, both PSA/DNA and MEARS have theorized that Jackson’s bats during this period were blank. What is even more troubling about these more recent determinations by the bat experts is a report they filed in 2008 when they authenticated another Jackson “Black Betsy” bat for SCP Auctions and Sotheby’s. That offering is proof that John Taube already knew of the existence of a professional autograph model of Jackson’s “Black Betsy” bat. That same bat was offered with a PSA/DNA report as a “1917-1921″ H&B pro model featuring Jackson’s name burned into the barrel appearing as a script “Joe Jackson” signature with a trade mark designation underneath. The bat had long been considered the only known authentic Jackson “Black Betsy” bat in existence dating back to its first public sale by Lelands in 1994 as part of the Dennis Goldstein Collection. Although PSA and MEARS are currently certifying blank barrel H&B "Black Betsy" bats as Joe Jackson gamers, the autograph model offered by Lelands in 1994 and SCP in 2008 stands in direct conflict with their opinions. At the time the “Black Betsy” sold in 1994 there was no recognized entity that authenticated bats outside of hobby equipment experts Dan Knoll and Dave Bushing. It was during that time period that Joe Jackson bats became a prime target for forgery and fraud. At the time, New York Yankee partner and collector Barry Halper claimed to own a game used Jackson “Black Betsy” and said he purchased it from the sluggers widow at her home in the 1950’s along with his 1919 White Sox jersey. Both of those items were sold by Halper to MLB and the Baseball Hall of Fame as part of an $8.5 million acquisition of Halper’s top artifacts in 1998, but after a Hauls Of Shame investigative report was published in 2010, it was determined that the jersey was a forgery constructed with elements produced after Jackson’s playing days and the alleged “Black Betsy” was nothing more than a Spalding store model bat that was never used or owned by Jackson. If the Hall of Fame had done their due diligence, they would have discovered that by 1998, the only recognized authentic Joe Jackson bat belonged to Rounder Records founder, Bill Nowlin. 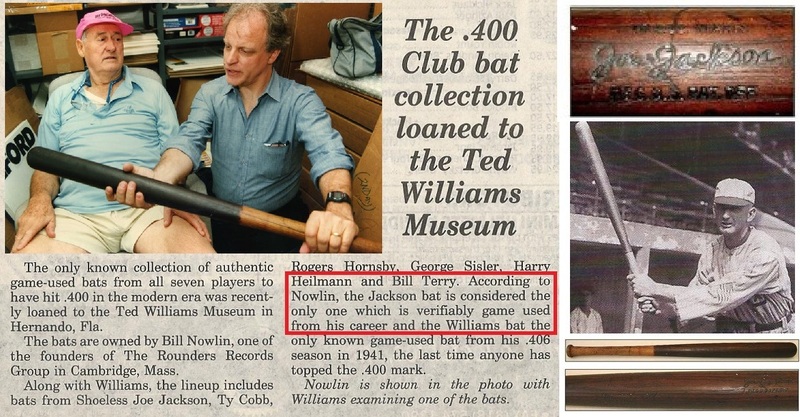 Nowlin’s bat was even publicly displayed as the only known Jackson example along with others from his collection at the Ted Williams Museum in Florida. The bat was displayed at the museum for several years until Nowlin decided to sell the bat for close to $300,000 in the 2008 SCP/Sotheby’s auction. At the time of that sale PSA/DNA issued a report and letter of authenticity for the bat SCP/Sotheby’s described as “one of only two known bats and the only full name signature model manufactured by Louisville Slugger Inc. that can be attributed to being used by Joe Jackson during his active Major League career.” The other bat referenced was the 1911 side written bat sold at Heritage. Now, in 2014, Robert Edward Auctions says that the “rarity of an authentic Joe Jackson bat cannot be overstated” and that both PSA/DNA and MEARS now claim that there are “six Joe Jackson game used bats in private hands.” According to Lifson and the experts, the population of this ultra rare “game used” artifact has tripled since the sale of Bill Nowlin’s Black Betsy model at SCP/Sotheby’s just six years ago. Bill Nowlin shows Ted Williams his Jackson "Black Betsy" in a story by SCD. The bat was exhibited for several years at the Ted Williams Hitters Museum in Florida. Nowlin believed that his bat was the only on verifiably "game used." To illustrate just how far the auctioneers and authenticators are willing to push the envelope in the unregulated memorabilia industry we point to Rob Lifson’s own 2005 endorsement of SCD Authentic’s “Grading Scale For Bats.” Lifson’s views on game used bats nine years ago starkly contrast his current stance working with PSA/DNA and MEARS. Back then, Lifson believed that although the bats he was offering his customers “were most likely game-used bats, there was no way to know with certainty the precise history of any given game bat.” Lifson added that, “There was no way to know if perhaps a given bat was used only in batting practice, or given away as a gift, having never been used at all, or borrowed by another player for use.” Lifson was correct in his determination that, “It can often be very difficult or impossible to distinguish game-used bats from those intended for use but never actually used by the player in a Major League game.” Nine years later, Lifson and REA are willing to say that the Joe Jackson style bat has verifiable game use and suggest that he may have used it in the 1919 World Series. In his 2005 endorsement of SCD Authentic's bat grading services, REA's Rob Lifson expressed views on "game used" bats that starkly contrast his current auction policies. Knowing that he has conflicting reports issued by two experts with different opinions, Lifson has done everything in his power to conceal that fact from the general public who have seen the bat touted on ESPN as an unquestioned Shoeless Joe gamer. Like all auctioneers, Lifson and REA will ultimately hide behind the opinion of their third-party authenticator and plead ignorance when it comes to the process of evaluating bats and explaining the conflicting opinions of his two expert reports. REA does include slightly out of focus and grainy images of the MEARS letter of opinion on its website, so collectors who read the information carefully can see the fraud that REA is attempting to perpetrate with the aid of PSA/DNA. Yes, for PSA and REA to say the bat being offered is a game used Jackson bat is outright and intentional fraud. Neither PSA or REA have any evidence to back up their claims and the existence of the MEARS opinion should have put both on notice that a “game-used” designation would be highly problematic. The REA bat for sale is not a new hobby discovery as it was publicly displayed at the MEARS booth at the National Convention in 2012 as a consignment to MEARS and comes with an c.2005 LOA from SCD Authentic that REA does not post on its auction site. Troy Kinunen told Hauls of Shame this week that the bat was consigned to MEARS but never sold. ”We never owned or purchased that bat and we returned it to the consignor.” MEARS issued their letter of opinion on July 27, 2012 and the owner at that time was fully aware that Kinunen had determined that the bat was not game used by Jackson. It wasn’t until the bat was submitted to PSA/DNA on September 23, 2013, that the bat transformed into an iconic baseball artifact. REA fails to mention that the MEARS letter of opinion for the Jackson "Black Betsy" fails to cite "game use." The bat first surfaced as a consignment to MEARS at the 2012 National where it was displayed at the MEARS booth. Hauls of Shame contacted PSA/DNA expert John Taube to ask for an explanation of his determination that REA’s Black Betsy style bat was actually used by Jackson in Major League games, but he did not return calls for comment. We also contacted Vince Malta at his San Francisco realty office, but Malta did not return our calls requesting an interview. 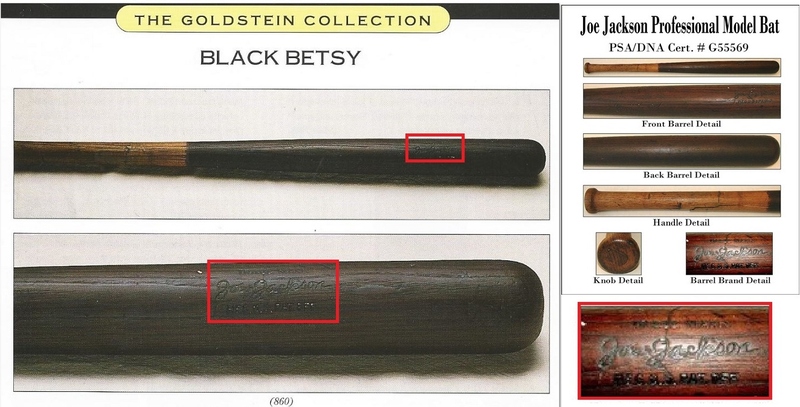 PSA/DNA issued an LOA stating that REA's Black Betsy bat was "game used" by Joe Jackson. PSA authenticator John Taube (center) also buys and sells bats through his company J.T. Sports. When it comes to bats, collectors put their faith in the experts and auction house executives expecting they are not being taken advantage of. When Bill Nowlin bought his own Black Betsy at Lelands in 1994 he relied solely on Lelands’ representation that the bat was genuine and that it came from the original 1980’s Louisville Slugger “find.” Nowlin, a renowned SABR baseball researcher, never thought to research the bat himself and looking back now says, “I should have asked for more information at the time.” Nowlin got lucky picking up his own Black Betsy since it appears to be the genuine article, but he wasn’t as lucky with others. ”I later learned that one or two other bats I bought from dealers were not legitimate,” says Nowlin. At the time this article was published the fraudulent REA Jackson bat already had two bids and stands at $55,000. Calls to REA president Rob Lifson for an explanation as to why he and PSA/DNA are trying to pass off the generic Black Betsy as game used were not returned. Who knows, maybe the yard sale purchaser can send his bat into REA on consignment. We hear they can turn “Shoeless Joe” stuff into gold. UPDATE (Mon. April 7th): High Bid of $55,000 Retracted on REA’s Fraudulent Shoeless Joe Jackson Bat; REA Said MEARS Expert Certed Black Betsy Bat As “Game Used” When He Didn’t; When Will Misrepresented Bat Be Removed From Sale? Since the time this article was published last week, the high bid of $55,000 appears to have been removed or retracted for Robert Edward Auction’s premier lot, the alleged “game used” Shoeless Joe Jackson bat. A call to the auction house this morning for details on the lot’s downward turn was not returned. REA not only tried to conceal the fact that the PSA/DNA and MEARS reports clashed, they lied outright and said MEARS called the bat "game used" when they didn't. A Hauls of Shame reader also pointed out that REA and Rob Lifson didn’t just attempt to conceal the fact that the PSA/DNA and MEARS reports clashed, they actually lied and wrote that MEARS certified the bat as “game used” along with PSA/DNA when they did not in their 2012 letter of opinion. MEARS expert Troy Kinunen did not return calls and emails requesting comment on REA’s false claim regarding his opinion. REA officials did not respond to our inquiry as to whether the bat would be removed from the sale. While MEARS has authenticated and graded this bat as a “Game used Black Betsy model bat attributed to have been used by Joe Jackson” and PSA DNA has authenticated and graded the bat as a “Black Betsy professional model bat that is “authentic and was game used by Jackson during the referenced labeling”, REA does not believe there is any way to prove with certainty (as is the case with virtually all vintage bats attributed to use by any player) actual game use by Joe Jackson. The addendum represents a 360-degree turn-around for REA and Rob Lifson who appear to be siding with the more conservative determination made by MEARS as opposed to the fraudulent determination made by PSA/DNA that the bat was “game used” by Joe Jackson. PSA/DNA has no evidence whatsoever that can put the bat in Jackson’s hands at any time during his career. Although REA has posted the addendum, they have still not corrected the line in the lot description which falsely claims that MEARS said the bat was game used by Jackson and one of only six game used examples known to exist. I don’t understand why the description doesn’t read – we have two certificates with differing opinions on the ownership and game used player specifics of the bat. We have a game used jackson bat certificate by psa/dna, and a game used bat of unknown player/attributed to joe jackson certificate by MEARS. Please see respective LOA’s for differences in description on the authenticity and ownership of the bat. Why can’t the description be that simple and clear? I don’t get it. simple, true, honest, the best way to do it. This is where Lifson lies in the description. It is near the beginning, saying Kinunen is calling it a game used Joe Jackson bat when Kinunen, in his own LOA from Mears merely attributes it to Jackson and is on record saying that he is not certifying it as a Jackson game used bat but merely attributing it to him. Readers will have to decide for themselves if it is fraud. According to the experts, the REA bat is “one of only six Joe Jackson game used bats in private hands known to exist” and auctioneer Rob Lifson claims in the lot description that “the offered bat is VIRTUALLY IDENTICAL to what is generally regarded as the finest Joe Jackson pro-model bat in the hobby,” the 1911 bat that just sold at Heritage for $956,000. I have items like A Jimmy Foxx autograph baseball that my Dad got from Jimmy Foxx when Foxx was in St.Louis and rode the Trolly when they were still running hear in and psa/jsa said it was real. My Mom was sitting right my Dad and My Mom and dad would play catch at the end of line on his lunch, My Mom was a big baseball fan and she was delighted to meet him. So my answer is this unless you seen someone sign it are seen them use and wear it you can, should only give a opinion. You can look for DNA, its impossible after so many years, I check because of so many other people that might of handled the ball are bat. Clothing maybe because of under are sweat could over years still be there even after one washing, maybe. But these people at the last show I went to with a witness, I signed a Ozzie Smith signature in the bathroom went into the show got his autograph went out got the people at psa/dna to give a certificate, and they said it would be mailed to me, my autograph of Ozzie Smith,WAY TO GO FELLOWS. This topic has been covered before but, since it has been on my mind as of late, I thought I would cover it again. When it comes to memorabilia, we are all familiar with the issue of outright forgeries and counterfeits. Part of the reason companies like PSA exist is because of this problem in the marketplace. Third party authentication services may not be the police and may not be perfect but they certainly help make the industry a safer place to buy. In addition to the issue of forgeries that plague all collectibles markets, there is another problem that is rarely discussed but equally as sinister. It is the seller’s intent to stretch the truth when it comes to a piece that is actually authentic to begin with. I know you are probably wondering why anyone would do that. It is very simple. There can be a huge difference in value between one type of authentic item and another based on the story behind it. Greed has been, and always will be; the downfall of many in this world and our hobby is certainly not immune to it. You could argue that this act is equally as disturbing as the act of forging something because you are tainting a collectible that was already authentic in the first place. Here’s an example, let’s say you have an authentic game-used glove. It can be of any player you choose. Let’s assume the glove is 100% authentic for the purposes of this hypothetical. The glove changes hands and is now in the possession of another hobby figure. The new owner tries to sell the glove, not only as an authentic game-used glove, but one that was used to catch the final out in a historic game, perhaps a World Series clincher or perfect game. If that is in fact true, it is a wonderful piece but what I am finding is that more and more stories are being told about the items without the evidence to support the claim. In some cases, the sellers are stretching the truth about a piece that was fine as is but they do it so you will stretch your wallet. Here’s another example. There is a ball signed by Babe Ruth and it is inscribed “To Joe” on the side panel. It is sold, originally, for $7,500 as a personalized Babe Ruth ball. The next seller puts it up for auction and claims the “To Joe” actually refers to Joe DiMaggio. He concocts an elaborate story and the same ball sells for $50,000 to a buyer who bought not only the ball but, more importantly, the story. There is no question that buyers need to do their homework and due diligence before spending their money but, if the truth has been stretched, it is still wrong nonetheless. Keep in mind that there are great items that are wonderful on their own merit AND they come with great provenance or significance. They do exist but, since they are rare, the greed factor is pushing some sellers into misrepresentation. They want to make a great item even better and more appealing than it already is. Sometimes, when things get tough, people get desperate. Is the tough economy possibly playing a role? It certainly isn’t helping matters but I am sure there may be a lot of factors at work. As a lifelong hobbyist, it is frustrating to see this occur. It not only helps devalue the truly great items in the marketplace but it also may scare off new people from collecting altogether. The reality is that there are plenty of incredible and completely authentic items to buy if you are interested in starting a collection. Sure, some items are incredibly scarce but that is no excuse for sellers to stretch the truth and ruin a good thing. Looks like the $55,000 bid on the alleged Jackson bat has been retracted and the bid now stands at $50,000. Rather a shame that such little care and attention was given to some of the uniform items in this auction as well. I can see how this information may have been overlooked and not included since frequent auction cycles, auction preparation and catalog production often comes right down to the wire, and this information has only been in the public realm for just slightly over six (6) years now. I suspect it would have all but been impossible to find this information since if go to Google and type in a search for “Brooklyn Dodgers White Satin Home Uniforms”, this article is only the #3 reference you would have been pointed to. I’m guessing shanus’ lawyers will have a field day with this one.Nice job REA. a recent Mickey Mantle card on eBay was PSA certified as “1963 Post Cereal” when it was very obviously a Jello card. If PSA can’t even get simple things like this right,obviously they are going to mess up on a lot of other stuff too. It is about time people have smartened up to these thieves and their fraudulent stuff, deemed authentic,congrats goes out to the person who pulled his bid, he just saved himself 50 G,s for garbage. Don’t know much about baseball, but know a hell of a lot about auctions. My advice: if there’s that much dispute about an item, run away rather than tarnish your reputation. Anyone think Dave Bushing would tolerate this? From SCD; “An outstanding 1919-1922 “Shoeless Joe” Jackson “Black Betsy” Pro-Model Bat graded GU 8 by PSA/DNA and A10 by MEARS, which sold for $48,809 when previously offered at auction elsewhere in 2004, was hammered down at $65,175. This whole situation is a disgrace, and MEARS is guilty, too, by throwing Jackson’s name around so much. There appears to be ZERO proof this bat has any connection to Jackson, yet MEARS throws his name into their “opinion” a billion times. Obviously, the collector community has spoken with their “deafening silence.” No intelligent collector would overpay for this interesting bat.